In terms of cuisine guests visiting the Swiss Alps resort of St. Moritz are spoilt for choice. Next to gourmet food, the restaurants in and around St. Moritz have summed up 270 Gault Millau points, visitors will find typical dishes from neighbouring Italy, regional favourites such as the Engadiner nut cake, and Swiss evergreens like Rösti. And now the Kempinski Grand Hotel spices up St. Moritz by welcoming Indian specialty chef Chhotu Kahatik in their team. Khatik was born and raised in Jaipur where he found his inspiration for the art of cooking through his mother and started to cook for his family when he was 16 years old. He then developed his skills in different luxury hotels in India, the Maldives, and Riyadh. Over the past years, he not only mastered the Indian cuisine but also fell in love with Italian food and started to experiment on a fusion of the two culinary worlds. “One of my favorite Italian dishes is “Pesce all’acqua pazza”, a recipe for poached white fish, which I put an Indian twist on by marinating the fish with Madras Curry. But I also love to prepare traditional Indian dishes, such as Laal Maans, a meat curry from Rajasthan” explains chef Khatik and continues: “I am very excited for my new role here at the Kempinski Grand Hotel des Bains and am especially honoured to work with such a skilled and awarded executive chef. Matthias Schmidberger and his team have given me a warm welcome and I am looking forward to getting to know the local cuisine and explore the lush Alpine landscape in St. Moritz.” Kempinski Grand Hotel des Bains will now integrate Indian dishes in the menu. About Kempinski Grand Hotel des Bains: Located in the sporty heart of the chic Alps resort of St. Moritz the five-star superior hotel is steps away from the cable car and sits next to the Mauritius Springs, legendary for its healing properties. 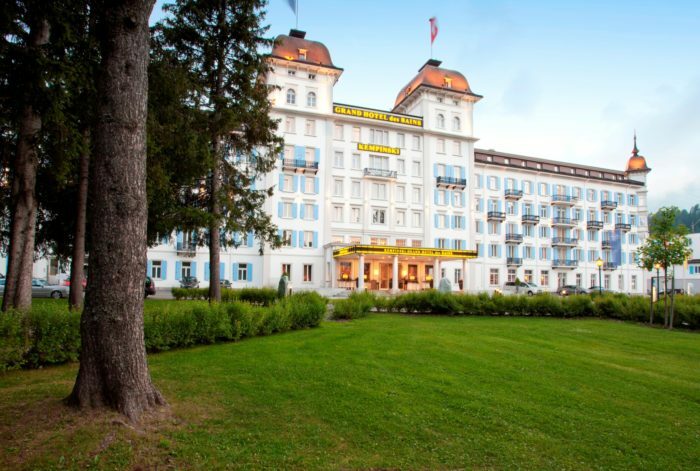 Kempinski Grand Hotel des Bains is set in an iconic building with a rich tradition since 1864 and offers 184 rooms and suites as well as 27 spacious residences with one to five bedrooms. Culinary delights can be tasted in the Lobby Bar and three awarded restaurants including the Michelin star awarded restaurant Cà d’Oro. The Alpine spa with the purifying and healthy Mauritius spring water offers the perfect blend of fitness, relaxation, and beauty on 2.800 sqm. Further amenities include a kids club, ski school and sports shop, 24-hour room and concierge services as well as a unique range of activities in summer and winter. The four function rooms with natural light are ideal for creative meetings and events.